3.4 out of 5 based on 23 bloggers and 3 commenters. 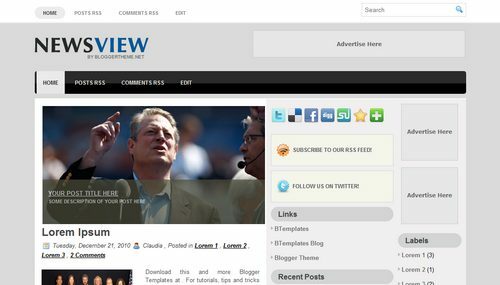 News View is a free blogger template adapted from WordPress with 3 columns, magazine-styled, right sidebar, rounded corners, slider and posts thumbnails. 1° Crea tu propio logo. Puedes usar el archivo PSD incluido en el paquete que descargaste (logo.psd). 2° Luego de guardar tu logo como imagen .png con fondo transparente, hospédalo en tu hosting de imágenes (tinypic, photobucket, picasa, etc).